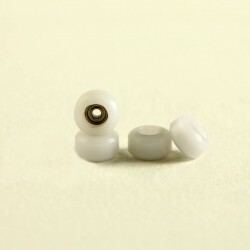 Those white trucks have to be assembled with silicon bushings, metal washers, screws and the final golden locking nut! 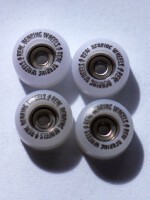 Those 4 white bearing wheels are perfectly molded, so slick and smooth. 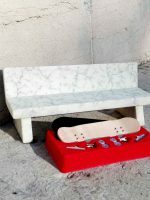 Your fingerboard will roll professionally! 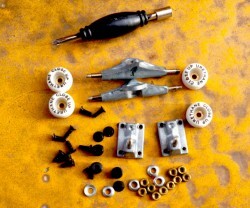 This article contains a pair of Grey trucks, a pair of bushings (thin and thick), 10 nuts, 10 crews, 4 metal washers, 4 White printed wheels with inside metal core and a tool for screws and nuts. This article is also delivered with a complete notice and a sheet of 4 Close Up stickers.